One of our sponsors for our Spring into Summer Sweepstakes is Rockin' Baby Slings. Rockin' Baby Slings was started by two moms back in 2002. 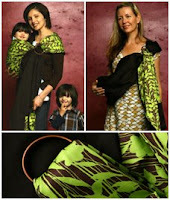 They had new babies and were trying to fill a need for stylish and functional baby slings. Babywearing is so beneficial to your child, it fosters the bond between parent and child, makes nursing so much easier and positively contributes to your baby's development. Babywearing benefits both parent and baby. Rockin' Baby Slings are awesome! They are made of 100% cotton linen, cotton twill, cotton poplin, or cotton voile in oh-so-stylish fabrics, are machine washable and are so comfortable to wear. There are five different positions that you can wear your sling in - sometimes you need that closeness and the ability to nurse, but other times baby may want to be facing forward and see what's going on in the world. When your baby is older (and up to 35lbs) you can even use your Rockin' Baby Sling to carry your baby on your hip or back (very convenient for getting things done around the house!). A Rockin' Baby Sling is not only a fashionable, but a functional baby accessory that you'll swear you'll never want to be without! Stop by and check out their huge selection of Baby Slings and Baby Pouches in tons of awesomely fashionable fabrics today! Don't forget, you can enter to win the beautiful Baby Sling pictured above during our Spring into Summer Sweepstakes! that green is absolutely my favorite color! what a gorgeous sling.